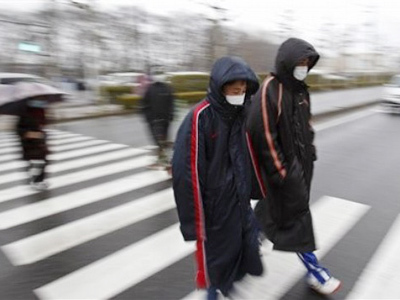 Amid fresh fears of nuclear contamination, inhabitants of villages and towns surrounding the Fukushima nuclear plant prepare for the worst. Some are trying to flee the country for fear of what might soon come. 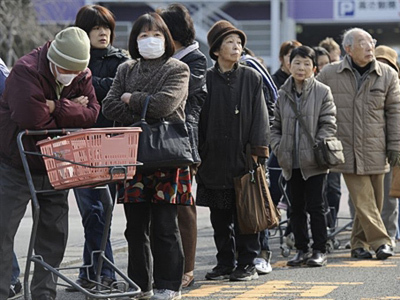 Residents of the Japanese city of Sendai are trying to stockpile what food is left and most shelves in local shops are already empty. 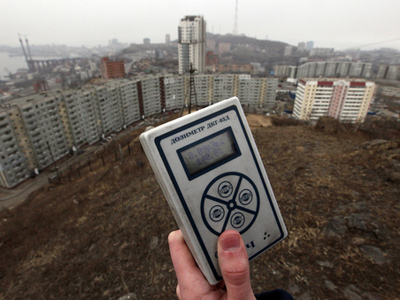 The people are also getting ready to hide, fearing an invisible killer: radiation. 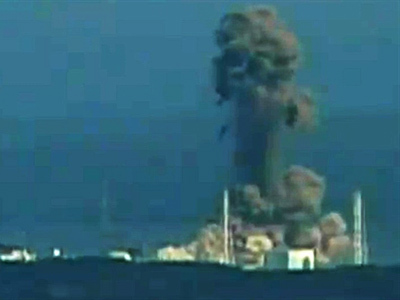 Two explosions at the Fukushima Daiichi power plant, which occurred on Tuesday, put the country on the cusp of a nuclear meltdown. One damaged the reactor’s outer casing and the final two reactors have now lost cooling capability, too. 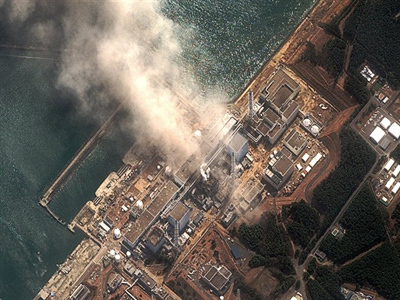 Radiation levels peaked near the plant at 400 times the amount normally absorbed in a year. There are fears radiation will spread across the country. Some fear that Japanese news outlets are not telling the whole truth. “There is some very strict censorship which doesn't let us understand the true picture – and that is not helping,” she added. While residents prepare to go underground, foreign news crews are fleeing. Foreign nationals in the town are trying to escape from Niigata airport, but flights from there to Osaka and Tokyo are already fully booked for the next several days. Thus, the exodus has begun. Despite the airport closing for the night, many are huddling outside, waiting for their chance to leave the troubled territory. However, some have nowhere to run to. Residents of the villages hit by the tsunami on Friday are returning to their hometowns just to find that there is simply nothing left to return to. More than half a million people have been left homeless, their belongings swallowed up and spat out by the tsunami. 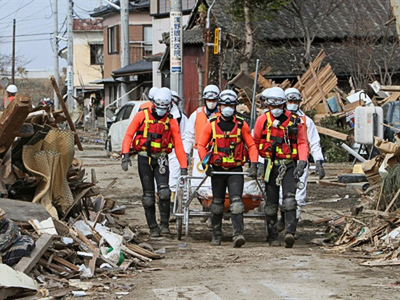 Relief workers are searching for survivors all along Japan's ravaged coast – what is now a sea of debris. An estimated 15,000 have already been rescued, but 7,000 are still missing and some places have not even been reached yet. Over 2,500 relief centers are still packed and will be for several weeks. 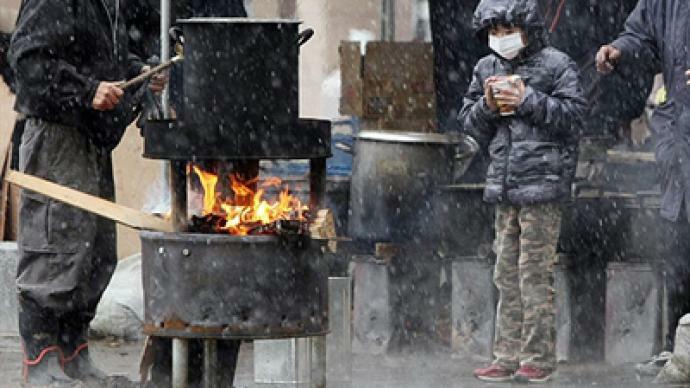 It is cold and uncomfortable in most of them now, but they are among the few places the people can get food and shelter. Huge parts of the country have been completely wiped out, but the threat of nuclear meltdown means there could still be more to come. ­Meanwhile, Professor Keith Ross from the University of Salford in the UK, an expert on radiation damage, says there are very good specialists in Japan who have great experience at dealing with such situations. He says the hazards people are talking about pale in comparison to the tsunami. 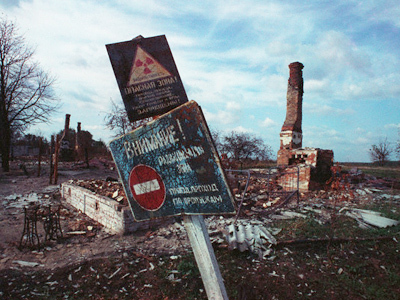 “My guess is the situation here is nothing like as bad as in Chernobyl… Most of the radioactivity will remain inside the vessels and can be sealed in. There may be contamination of the surfaces around the reactor but compared to the devastation in this part of Japan due to the tsunami, it will be a lot less”.